The Angleton/Eliot Same Man Theory lets the past illuminate the future. MAGI BLOWOUT SALE: XMAS JINGLE, MIDDLE EAST PEACE & SECURITY FOR ERSATZ ISRAEL! Win the trifecta in the Magi Blowout Sale! Put a little extra Xmas jingle in your pocket AND contribute to * Middle East peace through better understanding AND include security for the Khazar Ashkenazi Jews in Ersatz Israel all in one fell swoop! How? Find a high net worth individual or organization or movie producer to buy a very important letter written by the late, great JFK presidential adviser and American historian Arthur Schlesinger. The latest information from our Total Information Awareness Division indicates this letter is worth approximately 250% of one of Babe Ruth's sweaty ballcaps * recently sold at auction, or $2,000,000.00. You get me that amount and you may negotiate whatever you can for yourself over and above my price. Capisci? This Schlesinger letter (a short note, really) represents the first written reference by a notable person of my Angleton Eliot Same Man Theory. 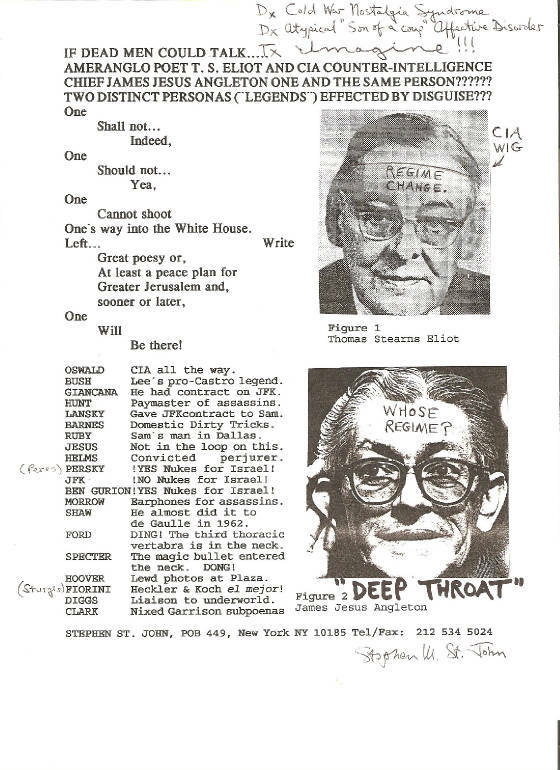 I believe that the late former CIA Chief of Counterintelligence James Jesus Angleton would pose as T. S. Eliot on counterespionage missions in London, England. I believe he did this with the help of disguises and doubles. And my theory was indirectly confirmed by the late former * CIA Director Richard M. Helms, who wrote in his memoirs (see page 153) that Angleton had a "not entirely coincidental resemblance to T. S. Eliot"; A Look Over My Shoulder, A Life in the Central Intelligence Agency, was published on 7 April 2003, 15 months after I received Schlesinger's letter of acknowledgement. You can view a scanned copy of this momentous Schlesinger letter and obtain more background information on my website * at http://www.show-the-house.com/id35.html. I like to say this letter is not a museum piece, but rather, it is live ammunition. If my Angleton Eliot Same Man Theory is correct, then the histories of the Cold War, the Jewish state's nuclear weapons program, the JFK assassination and our quest for a Middle East free of weapons of mass destruction must be rewritten in light of this information.